Taipei, Taiwan, July 12, 2018 (TEIA)– The largest scale amendments to Taiwan's Air Pollution Control Act (空氣汙染防制法) since 2002 were passed during Legislative Yuan's extraordinary session in the evening of June 25, 2018. The session featured a heated dispute on whether the Taiwan Environmental Protection Administration (Taiwan EPA) should jointly decide with or consult with the Ministry of Economic Affairs (MOEA) on total emissions control and emission quota exchange. After several rounds of consultation, the bill passed third reading. However, there is a clause that imposes a regulation that the Taiwan EPA should consult with the MOEA over the matters and then file for Executive Yuan's approval. Central News Agency (中央社) reported that it took nearly 6 hours to finalize the amendments to the Air Pollution Control Act. The third reading began at 20:30 and finally passed at 21:32 on June 25th, 2018. There are more than 5 millions two-stroke scooters manufactured before July, 1999. Photo: Kay Li for TEIA. Legislator Chen Man-Li (陳曼麗) explained that several articles she proposed together with environmental groups had been added to the amendments. These amendments, include: setting up a central government level air pollution control plan; switching to gas power under a state of emergency, but tightening its usage and eventually ceasing by 2025; increasing the proportion of air pollution control fees that go to local governments; allowing both individuals and groups to report illegal activities; and setting up a legal aid system. 1. The relevant authorities at all levels may delineate “Air Quality Control Districts (空氣品質維護區)” in accordance with total emissions control requirements. 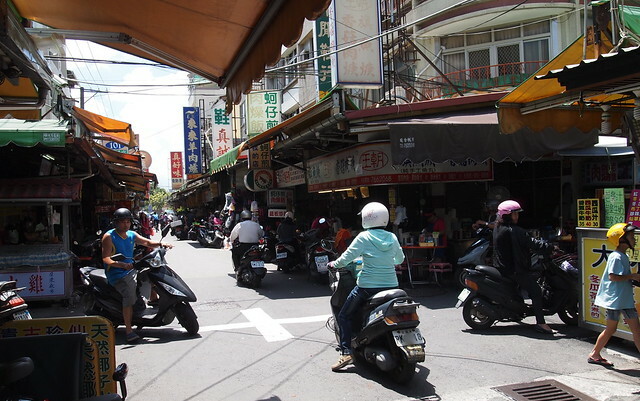 Within a delineated district, the use of motorcycles and motor vehicles can be limited. Additionally, prohibiting pollutant emissions in public and private places, suspending schools activities, and other emergency measures will be implemented in response to extreme events. 2. The central relevant authority shall standardize the proportion and composition of fuels for combustion in order to ensure fuel quality from supplier side, thus minimize pollution caused by burning impurity substances. The local relevant authority shall be authorized to review and issue a use permit. 3. Measurements of health risk factors will be included in new air pollutant emission standards. Legislator Wu, Yu-Chin (吳玉琴) additionally remarked that the amendment on delineating Air Quality Control Districts will endow the local authorities to enforce the ban on unqualified coach buses entering these districts. In the past, local governments and environmental protection authorities put restrictions on coach buses that do not meet emission requirements from entering scenic areas, such as Alishan and Sun Moon Lake, to maintain local air quality. However, such enforcements were not mandated by law and often caused conflicts and consequential lawsuits. The amendments also expand the applicable places from scenic areas to ports, industrial parks, schools, hospitals, etc. 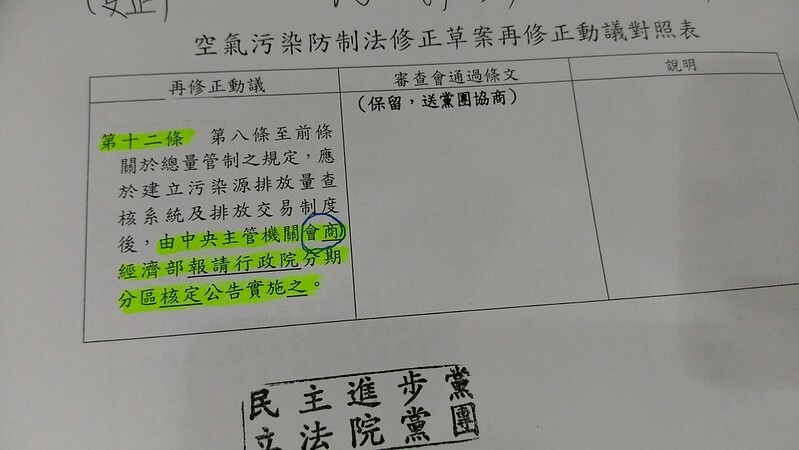 Reported by New Talk (新頭殼), the “Good Neighbour Clause” had been added to the passed amendments. Relevant central authorities shall set up air pollution control plans and review them every four years. Local governments should discuss with the relevant authorities in neighboring counties or cities because air pollutants have no boundaries. The amendments also stipulate a tighter emission control over vehicles that have been in use 10 years or more. For those that fail to undergo regular air pollutant emissions testing, the motor vehicle owner shall be fined NT$3,000 to NT$60,000 and notified to make corrections or improvements within a limited time period; for those who still fail to do so by the deadline, their operations and authorization certificates may be cancelled. This will bring significant impacts to more than 5 millions two-stroke scooters and sixty-seven thousand diesel trucks manufactured before July, 1999. Moreover, each relevant authority may delineate its own Air Quality Control Districts in accordance with current air quality conditions and air pollution characteristics. Certain types of motor vehicles may be prevented from entering a controlled district and violators shall be fined NT$500 to NT$60,000. After several rounds of consultation, the bill passed third reading on June 25, 2018. Photo: Legislator Chen Man-Li. Liberty Times (自由時報) reported that the passed amendments give authorizations to relevant authorities at all levels to delineate their own "Air Quality Control Districts” to control local mobile pollution emission sources. These controls include limiting particular motor vehicles from accessing the districts as well as prohibiting the use of specific fuels, power forms, operation conditions, operating status and access of mobile pollution sources. Local governments may implement actions in an air quality control districts to secure air quality control. Examples include: Preventing diesel trucks manufactured before July, 1999 or two-stroke scooters to access the district for the whole day or within limited time slots; Mandating that ships reduce air pollutants emissions by using low-sulfate diesel fuels, using onshore power supplies for operations at the berth, and reducing voyage speed upon arrival and departure. Public and private premises with stationary pollution sources regulated by the Taiwan EPA and stationary pollution sources that use bituminous coal as fuel or axillary fuel shall meet the Taiwan EPA's regulations and obtain a use permit from local government before building or modifying the sources. Those wishing to continue to use their permits upon expiration shall submit a permit extension application to the local government. However, the local government shall not perform installation or modification pursuant to the permit contents. In this regard, the local government's discretion on modifying permit contents is limited. According to SET News (三立新聞), Air Pollution Control Fee (空氣汙染防制費) used to be fully and solely managed by the Taiwan EPA. This year's amendments will become the source of law to allocate funds to local relevant authorities, i.e., sixty percent of the collected fees from stationary pollution sources goes to local governments. Along with a newly implemented regulation, twenty percent of the collected fees from mobile pollution sources goes to the owner's registered address or where the fuels are sold. Furthermore, the pecuniary fines from violating Air Pollution Control Act will be the funding source of Air Pollution Control Fund (空氣汙染防制基金). Penalties for violating pollutant emission were aggravated in the amendments, too. When the stationary pollution sources of public or private premises emit a large quantity of air pollutants due to a sudden accident, the statutory responsible person shall promptly adopt emergency response measures and notify the local relevant authority within one hour; in the case that it causes human death, the responsible person person shall be punished by life imprisonment or a minimum of seven years imprisonment and may be fined a maximum of NT$30million; those that cause harm to human health such that it leads to illness shall be punished by a maximum of seven years imprisonment and may be fined a maximum of NT$15million. Green News Taiwan aims to enable non-Chinese speaking people around the world to access environmental information on Taiwan. Green News Taiwan is a cooperate project between TEIA and a group of volunteers committed to the beautiful environment of Taiwan.